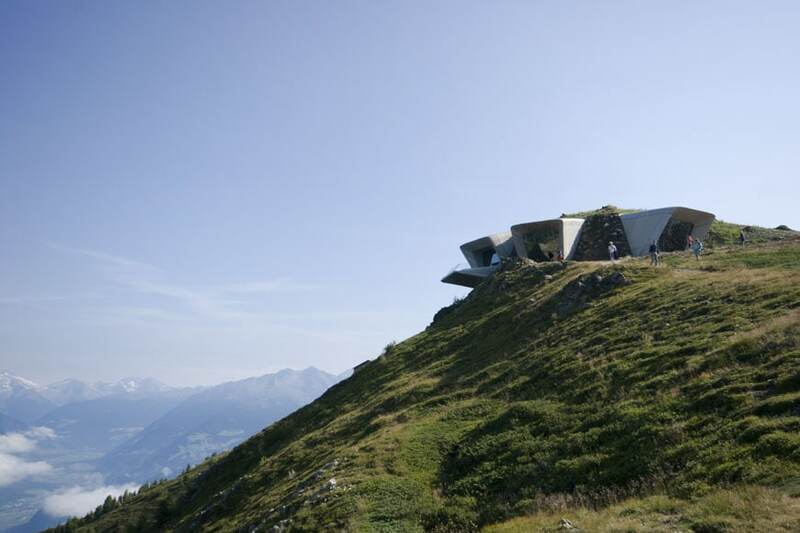 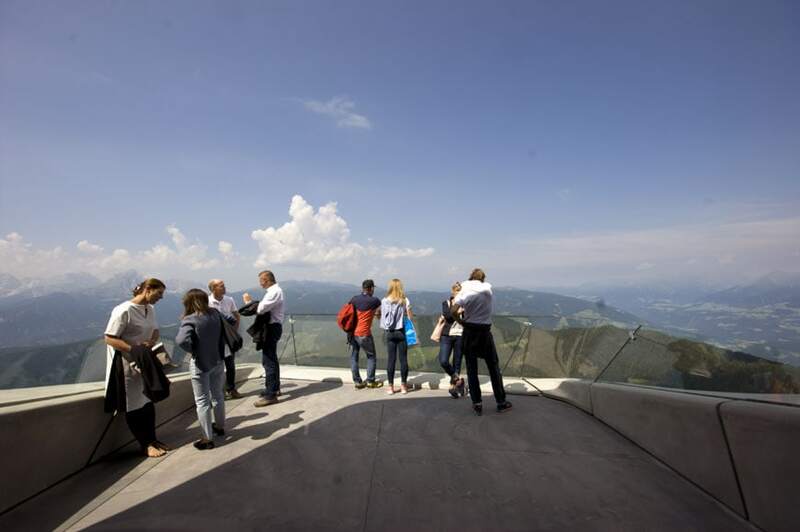 July 23, 2015: the new Messner Mountain Museum Corones opens its doors. 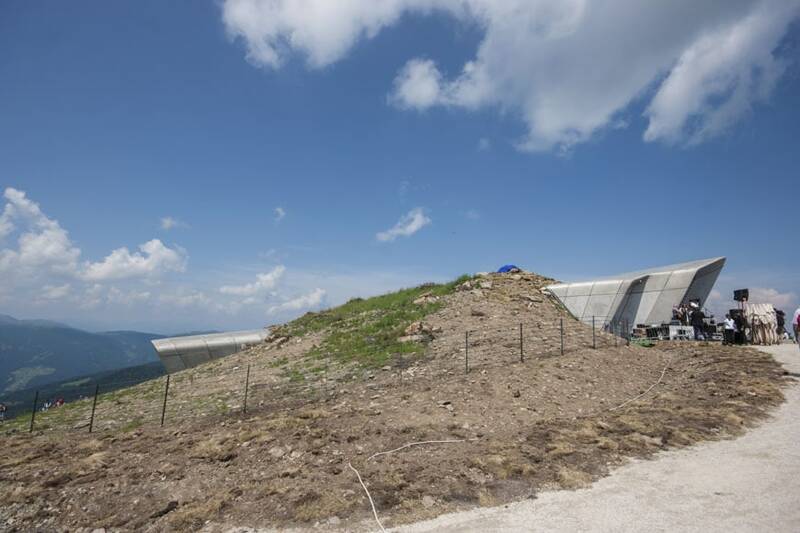 After months of works at the limit – on-site construction needed to be halted in Winter due to the prohibitive conditions of the mountain’s peak where the building lies – the museum designed by Zaha Hadid Architects was finally disclosed to the public. 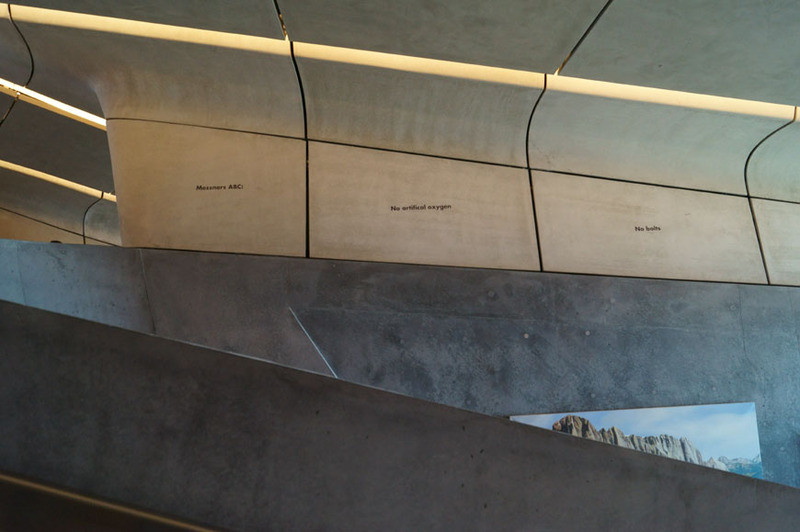 Inexhibit was present at the grand opening of the museum, and we can present here our impressions, detailed information of the project, thanks to Zaha Hadid Architects and especially to Patrick Schumacher who explained the project and its concept, as well as a series of exclusive photos we made there. 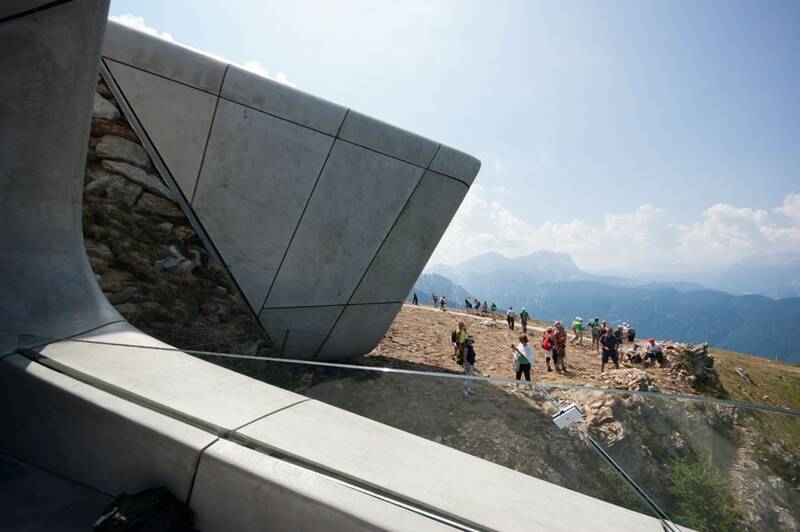 The creation of the new MMM Corones museum – the sixth of the network devised by climbing legend Reinhold Messner – was truly an epic challenge, both because of its site, on the top of the Kronplatz mountain in the South Tyrolean Alps at 7,463 feet above sea level, and for the complexity of its architecture. 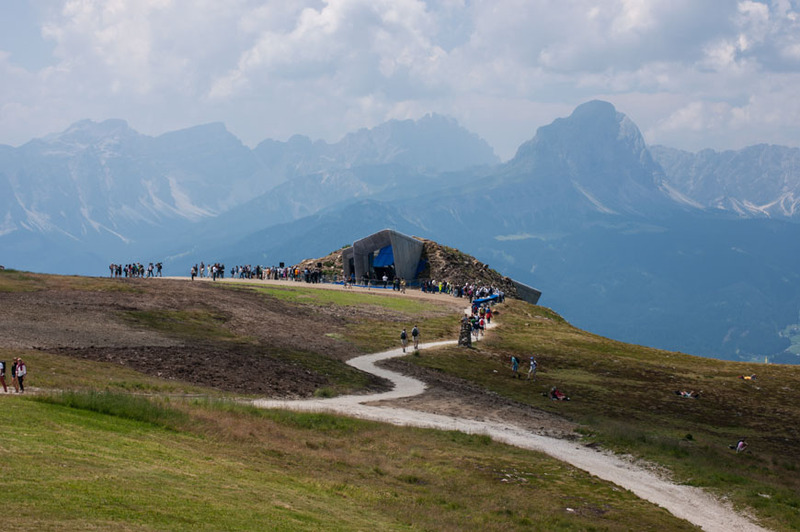 The new MMM Corones is a place conceived for mountain-lovers. 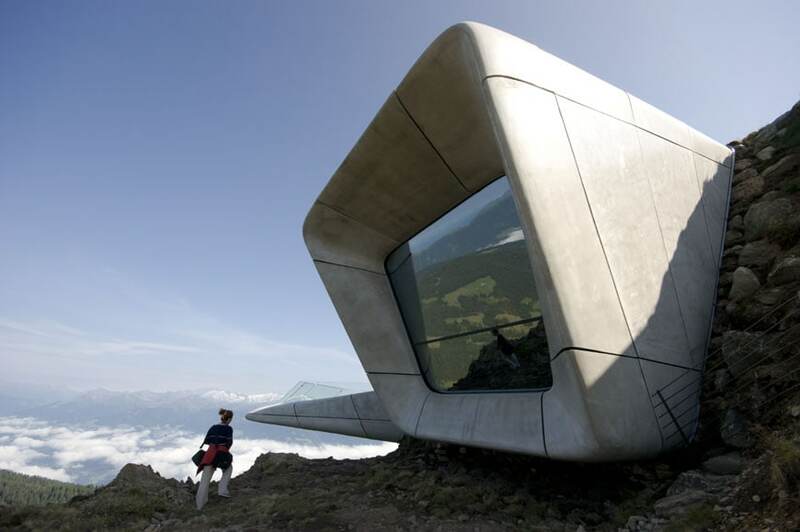 Dedicated to traditional climbing, the museum is first of all an extraordinary viewing machine: the volumes that protrude from the ground, like four large eyes wide open on a majestic landscape, seem to emerge from the earth’s bowels to invite us to admire the Alpine chains around, from the Zillertal to the Ortles to the Dolomites. 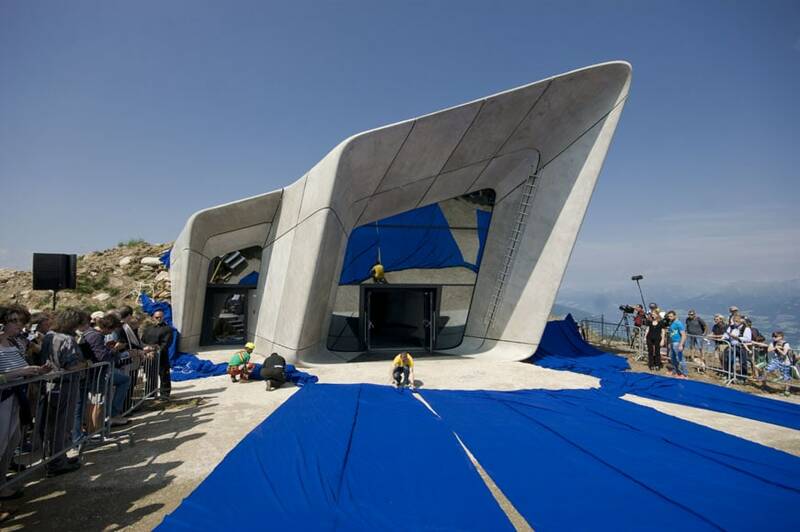 The MMM Corones is described by Zaha Hadid as “A composition of fluid, interconnected volumes (…) carved within the mountain and informed by the geology and topography of its context“. 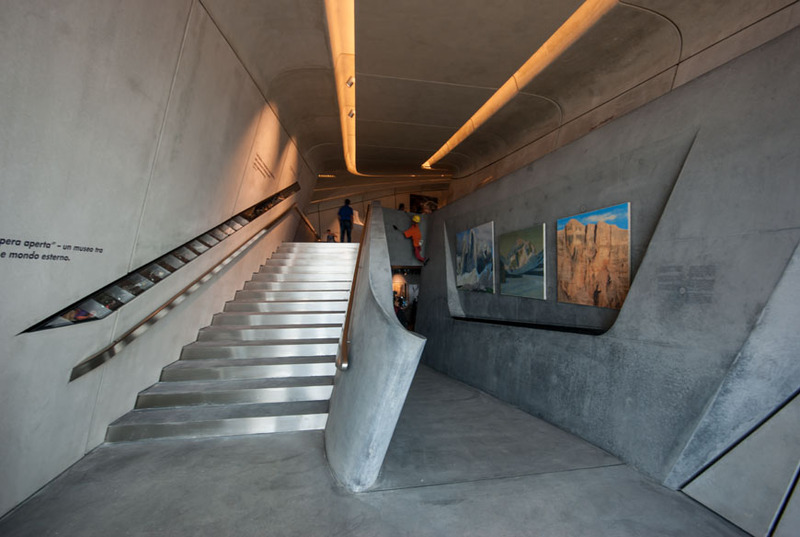 The reinforced-concrete building, on a floor area of 11,000 square feet, includes three levels of temporary exhibition galleries, a small multimedia-theater, and various service spaces. 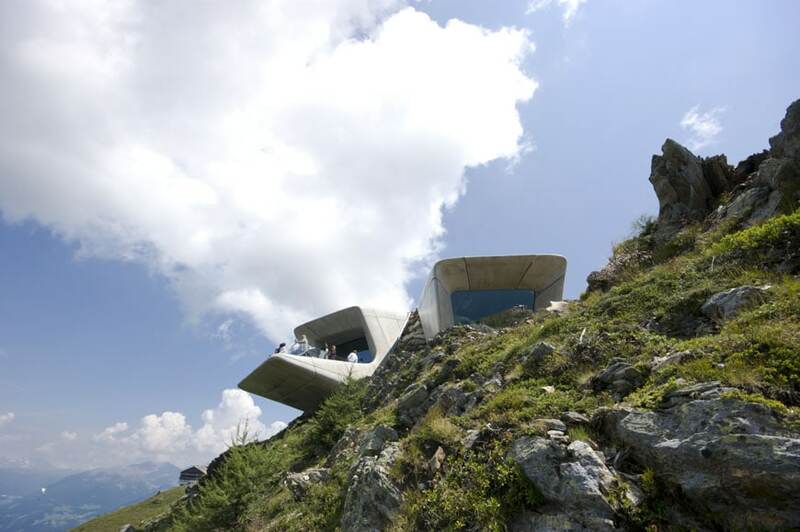 Three large windows and a cantilevered balcony protruding from the cliff edge, along with providing natural lighting to the internal spaces of the museum, create an impressive contrast between their dazzling brightness and the somehow obscure and labyrinthine internal space which progressively dissolves into the mountain. 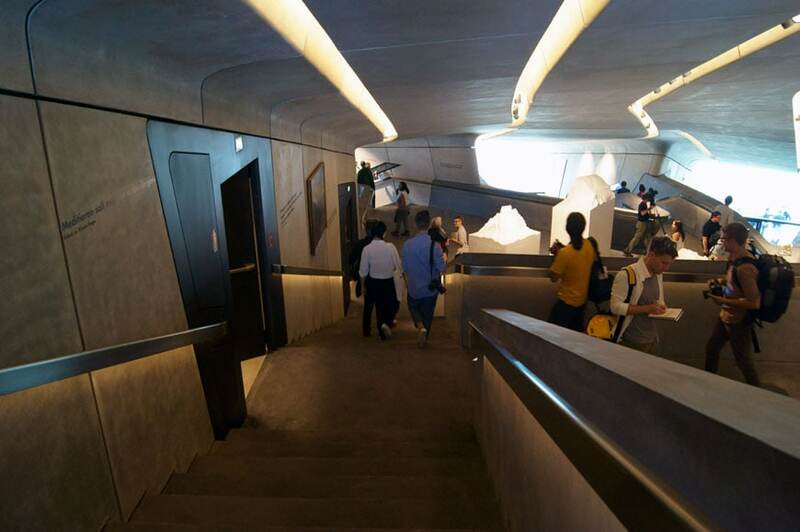 You have to look back nearly 30 years, when Zaha Hadid first entered the architectural scene by winning a major competition for a private club to be located in a peak in Hong Kong, a project very much like this, yet which remained unbuilt. 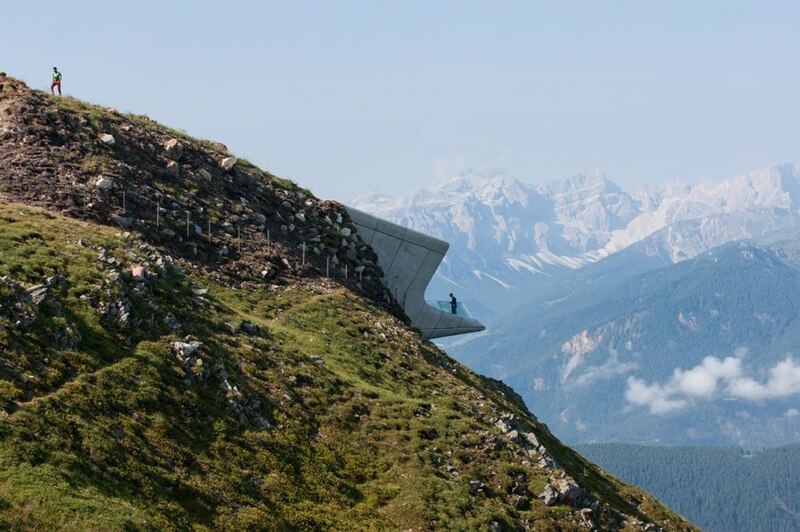 Her idea at the time was to have something carved into the mountain and cantilevering off the slope to create an artificial architectural tectonic landscape embedded into a real mountainscape. 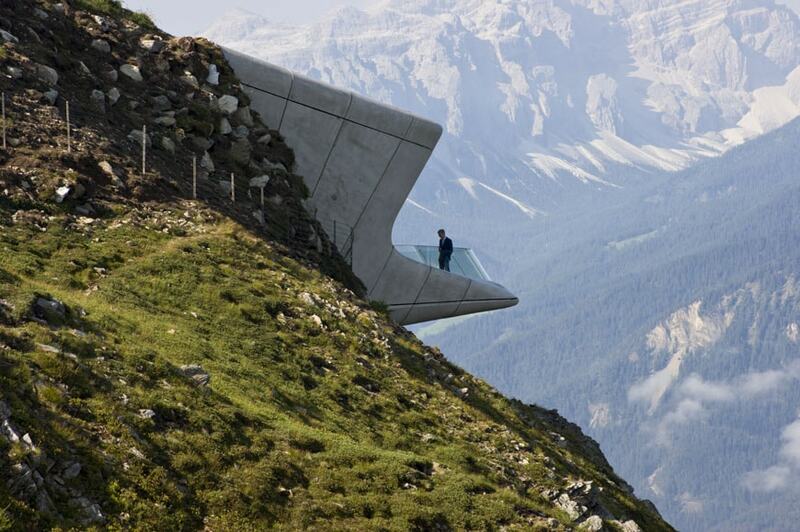 The whole design language of Zaha Hadid has evolved into the idea to make architecture more landscape-like. 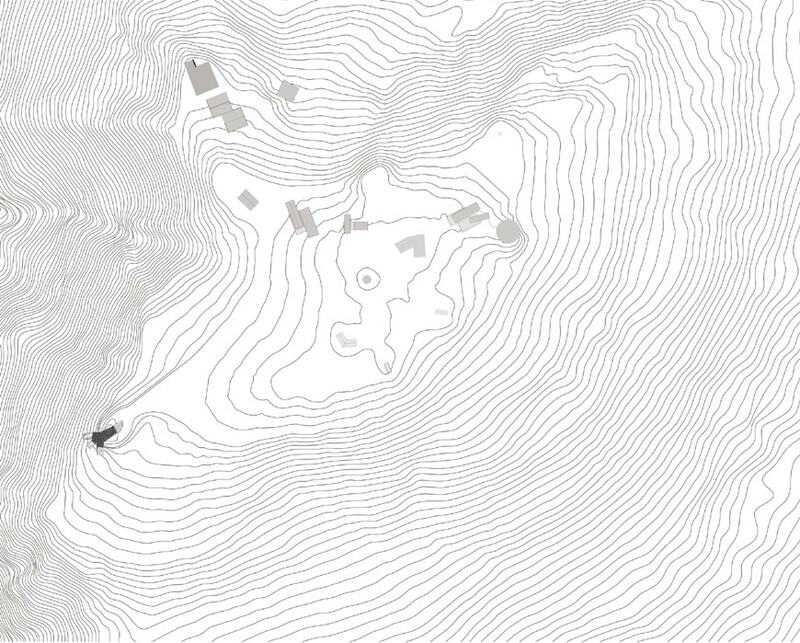 The features of the landscape we like are its dynamism, open-endedness, fluidity, flowing from zone to zone and from space to space, and an “open texture” which we try to emulate in an architecture which goes beyond symmetry, proportions and static segmented rooms. 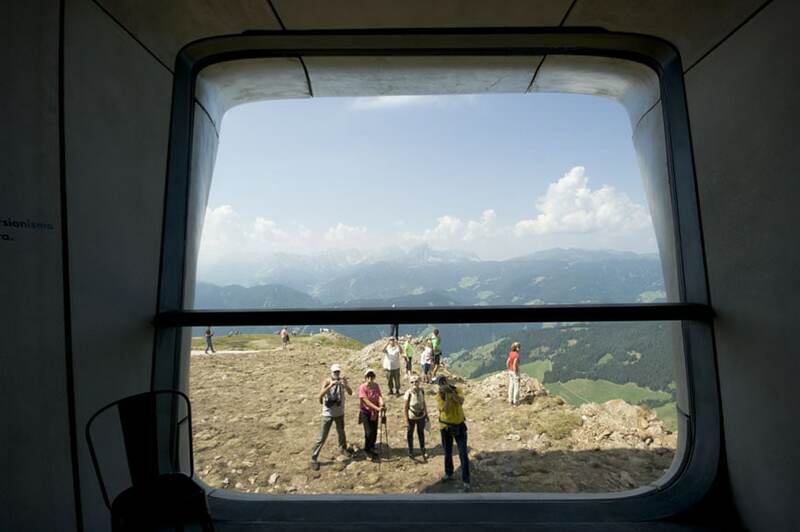 The project of the Messner Mountain Museum Corones was very much guided by Reinhold Messner himself, he wanted to go deep into the mountain and then emerge with three elements, which eventually became a balcony and two large windows, projecting forward from the slope to frame the silhouette of the three mountain massifs of the Zillertal, Ortler, and Dolomites. 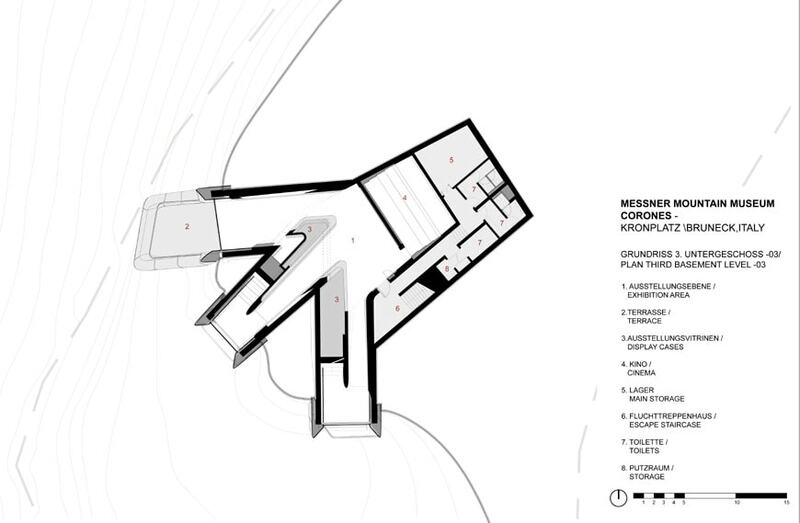 We have translated his vision into our language and through our artistic sensibility. 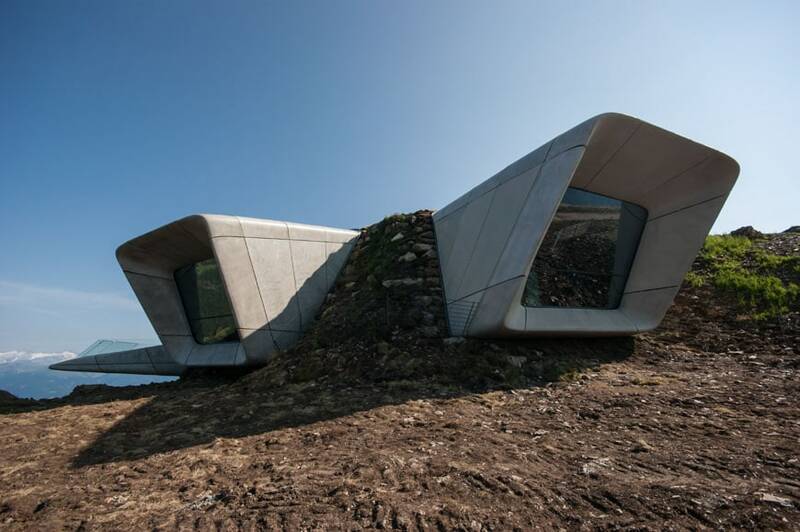 Such collaborative effort allowed this museum to become a total artwork, a Gesamtkunstwerk, where we have an immersive environment, where there is a coherency between the exterior and interior articulation, and one coherent material which color is similar to that of the rock formations around. 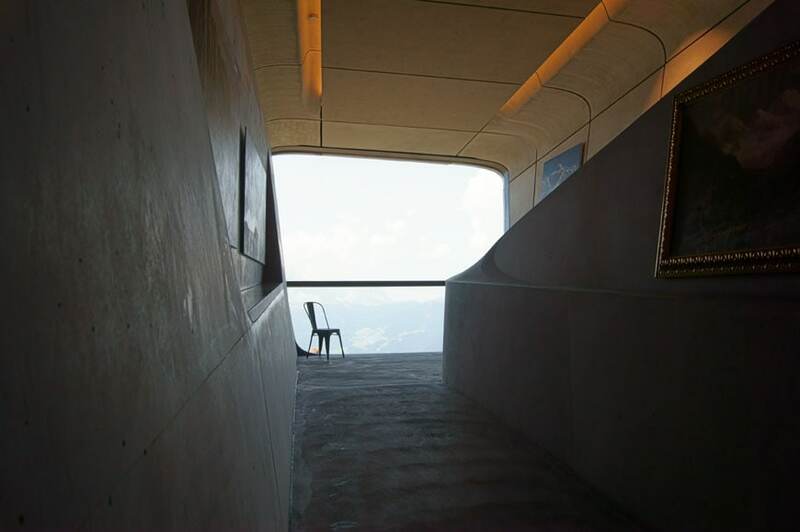 To place objects and artworks into this museum was somehow inspiring, difficult and challenging, we put artifacts, images, and imaginative mountainscapes into “frames” to generate a dialog with the real mountains, and to create a world of imagination, dreaming, and stimulation. 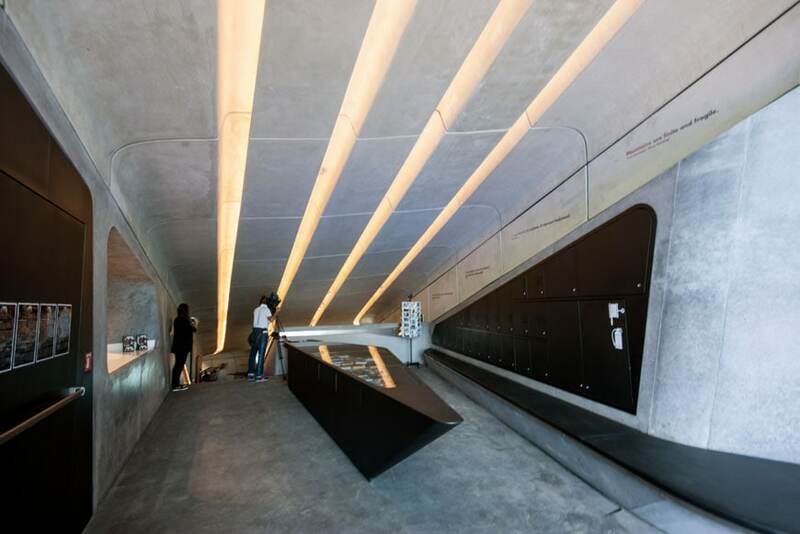 The opening of the Corones’ museum implicitly arises the theme of architecture as a “challenge” to nature. 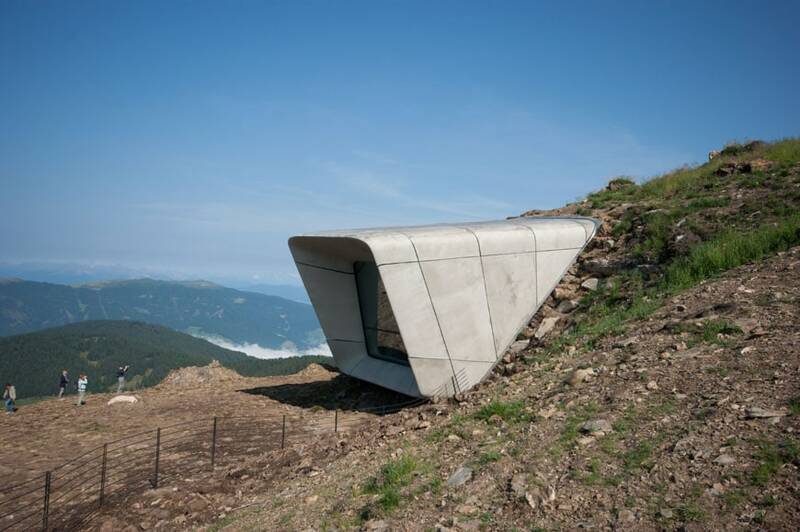 There are several reasons against building in a sensitive environment, like Alpine peaks, which for many, and for good reasons, should be inviolable. 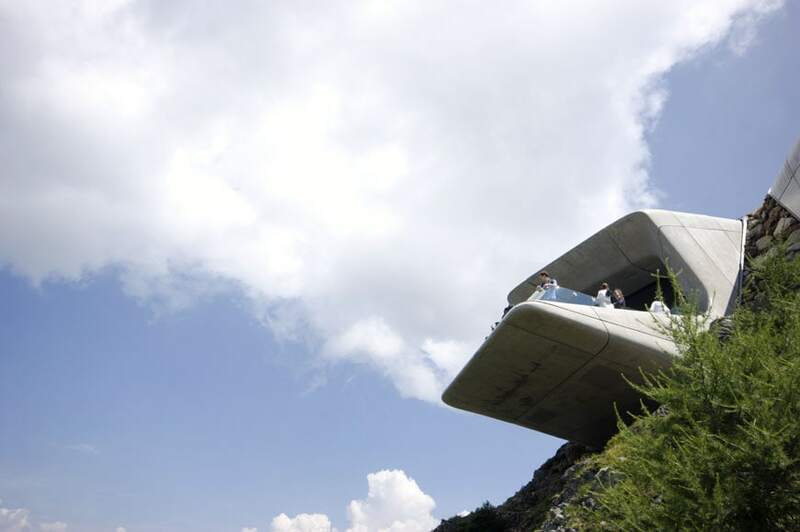 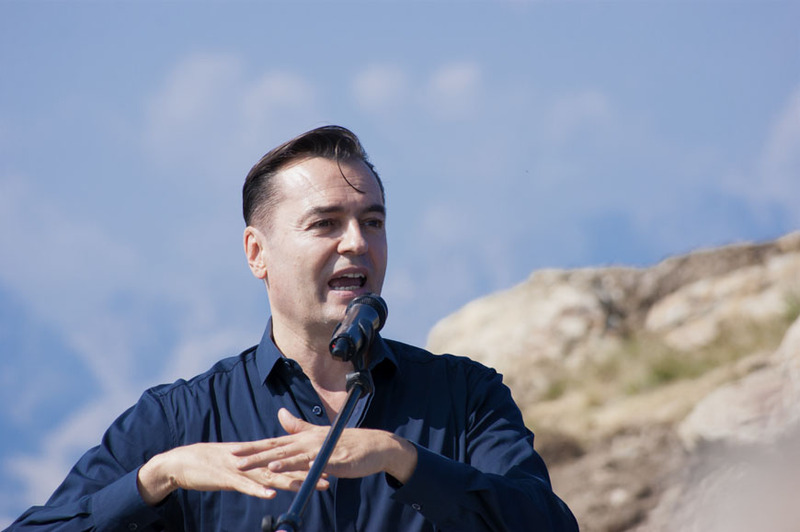 At the same time, in the history of the relationship between men and landscape there is plenty of examples of architecture and engineering challenging nature: from Dutch “polders” to the “Metéora” Greek monasteries, from defensive fortifications to masterpieces of modern architecture such as F.L. 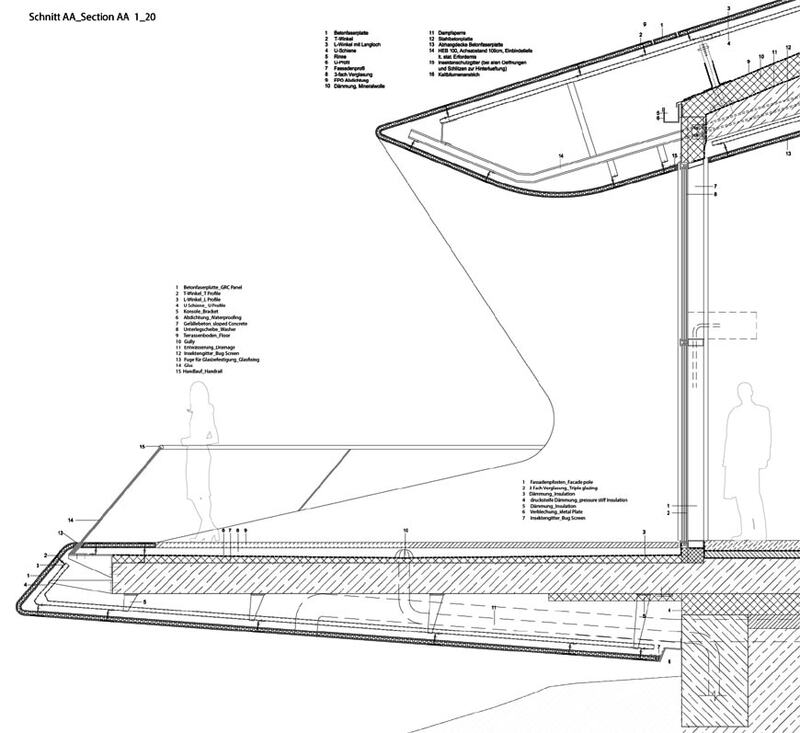 Wright’s Fallingwater house or the Casa Malaparte in Capri by Adalberto Libera. 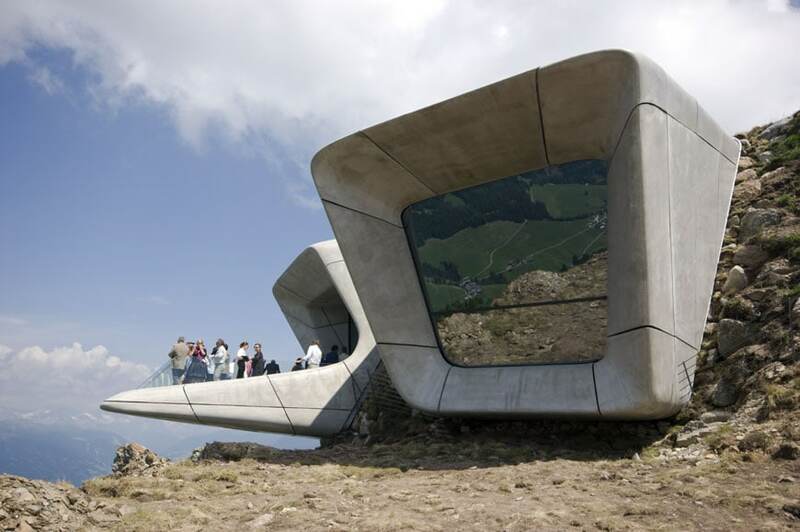 Sometimes the “extreme” encounter between architecture and landscape produced excellent examples of a symbiotic union of building and nature; in other cases, it produced monsters and tragedies.